Built by Consolidated. Delivered to the U. S. Army. Ferried overseas via Hickam Field across the Pacific to Australia. Assigned to the 5th Air Force, 43rd Bombardment Group, 403rd Bombardment Squadron. No known nose art or nickname. When lost, engines R1830-42 serial numbers 42-87669, 42-87346, 42-62741 and 42-87535. Weapon serial numbers not noted in MACR. On October 13, 1943 took off from 7-Mile Drome near Port Moresby on a bombing mission against Rabaul. This aircraft was last seen entering a weather front forty miles off Kiriwina. Crashed on reef in the Amphlett Island Group, all were killed in the crash. 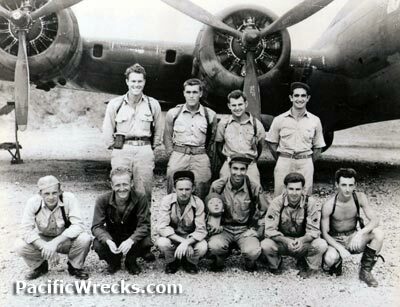 When this bomber failed to return, the crew were officially declared Missing In Action (MIA). 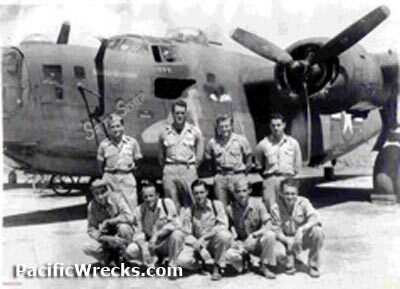 An aerial search was conducted by three planes but failed to find any trace of this bomber. Bonner has a memorial marker at Oak Hill Cemetery in Water Valley, MS.
Baumgartner has a memorial marker at Saint Pauls Blue Church Cemetery in Coopersburg, PA at section L.
Tucker has a memorial marker at Christ Church Episcopal Cemetery at Saint Simons Island, GA.
Lavalle has a memorial marker at Holy Sepulchre Cemetery in Chautauqua County, NY. Moeller has a memorial marker at Hillcrest Cemetery in Decatur, NB at section 2. "It is feared they collided with a P-38 in the soup weather." American Battle Monuments Commission (ABMC) - Coleman P. Butler Jr.